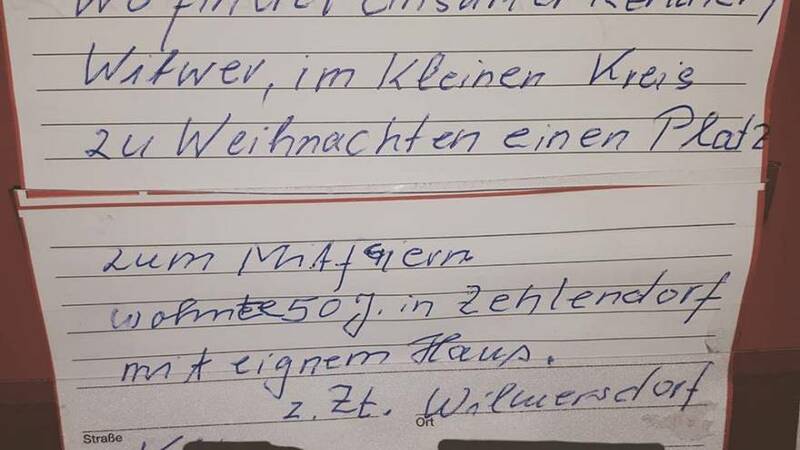 An elderly man in Germany who thought he would be spending Christmas alone this year has been flooded with invites after posting an advert looking for a place to spend the festivities on a supermarket notice board. A shopper saw the ad in the supermarket in Berlin and posted it on Facebook, urging other social media users to share it far and wide. “When I read this, it broke my heart,” Facebook user Femina Lisa explained in the post. More than 6,000 people shared the post, with many extending Christmas invites to the man, who describes himself as a retiree and widower. Due to the high number of requests, Femina Lisa said she had stopped sharing the man’s contact details, which are hidden in the post. While it remains to be seen where the pensioner will be spending his Christmas, it seems certain that he won’t be alone.